With the theme still going strong from this weekends events .. 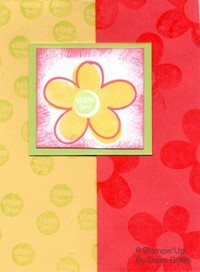 It seems only appropriate that I reflect on my Past with Stampin Up! This October will mark 3 years since I signed up to be a demo with SU! and WOW what a blessing SU! 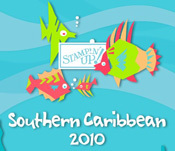 has been in my life .. Stampin Up! Is a Huge part of my life but Thats not all of who I am . I found SU! at a time in my life when I was totally unaware of what a Rubber stamp can do to change my life & others around me .. actually it was my cousin Ruthie who introduced me this wonderful world of SU! I attend her workshop with a demo that would end up being my upline ( Lisa ) It took my 6 months to finally bite the bullet and buy the starter kit with of course my Main supporter being my Husband ( of course to save money was his hidden agenda ) either way It was added to my LONG list of " "The Best thing I ever did List" ) In 2001 I was diagnosed with Rheumatoid Arthritis after I signed up in Oct 2003 I found that when ever I was stamping I noticed I felt better .. Call it stamping out the pain or whatever you want I knew I felt so Great when I was creating I was in my own little world and knowing I could bring the slightest smile to someone that I made a card for made this a GOD sent for me .. I soon told the Lord I knew this was what HE wanted me to do and That some way I wanted to Glorify HIM so soon after I signed up I started making cards every month for all my church family everything from thinking of you , Happy Birthday , Happy anniversary you name it I was so excited . Now with almost 3 years under me now as a SU! demo so many folks come to me at church and ask if I will make cards for them weather its thank you notes for our Youth group , to just a pack of 10 cards for their own personal use, Graduation announcement ..My Mom is also My biggest encourager she tells me all the time that Stamping is Gods calling on me and My life .. 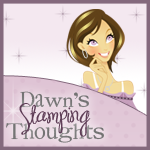 I Don't claim to know all there is to know about stamping BUT I do know stamping has changed my life and I love having it be a BIG part of my life to share with others .. When I signed up I was NOT going to peruse the business end of SU! I just wanted the discount and thats all .. ( That was a understatement There was NO way i was going to do workshops ) Well that all changed 3 weeks after I got my starter kit ..My dear friend asked for me to do a workshop I was so nervous and excited at the same time After that 1st workshop I knew if I could touch womens life's in a way that was instantly gratifying and the feeling of accomplishment, It was going to be a AWESOME Journey !! well as they say the rest is History .. Below is My 1st card I made at my very 1st workshop I personally had before I was a demo .